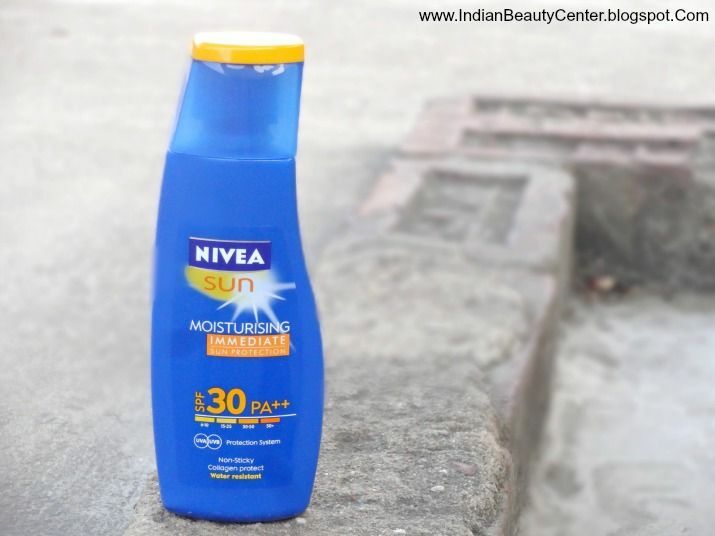 Product Description : NIVEA Sun Moisturising Sun Lotion cares for your skin in more ways than one. It combines strong UVA and UVB filters that shield the skin from sun damage with rich moisturizers and vitamin E that protect the skin from dehydration to ensure that you're better protected, because well cared for skin is less vulnerable to sun damage. NIVEA Sun also offers immediate sun protection, which means you don’t need to wait for 20 minutes before stepping into the sun. Available SPF 30+ & 50 + No more waiting for 20 minutes before you step out into the sun! 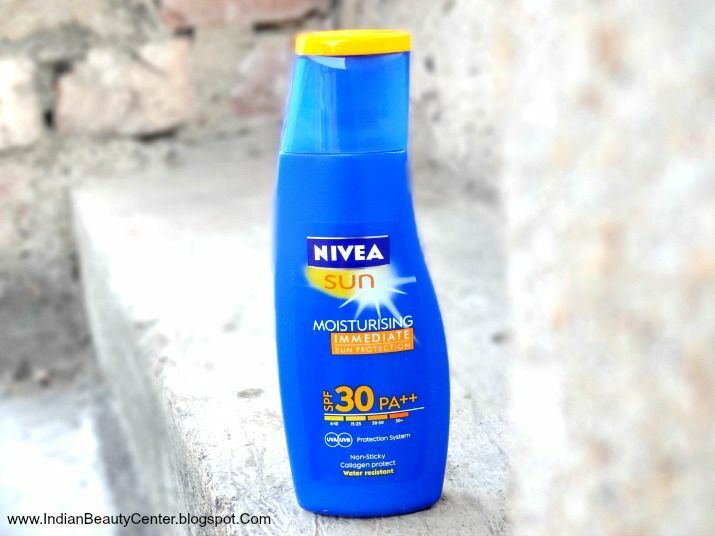 NIVEA’s caring formula let’s you enjoy instant & long-lasting sun protection. Shelf Life : 30 months from Mfd. I have not used it on my face because this comes in a body lotion kind of packaging. So, I did not experiment with my facial skin. 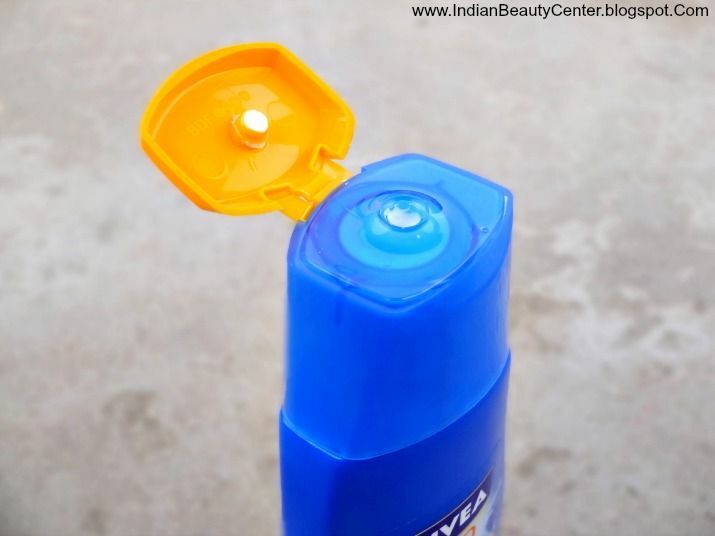 But, I have tried this sunscreen, that comes with a flip-open cap, on my body. It is white in color smells mild but like has a fragrance like that of shaving foam. Anyways, the fragrance just fades away within 15-20 minutes. This is travel friendly as the cap is really tight and it did not leak in my bag. I have to carry it with me because the wear time of this is less. I find myself reapplying this sunscreen lotion every 2 hours to protect my skin from getting tanned. When I apply this, I notice that it instantly brightens my skin and lightens it. But the effects are very temporary and the brightness goes away in half-an-hour's time. It is water-resistant and not water-proof. At the expensive price tag that it comes with, I was expecting much more. It claims to protect the collagen of my skin and also to prevent wrinkles. I have been using it for a month now and I have not tanned yet. But, yes, you need to reapply frequently. Coming to the consistency, it is easy to apply this lotion and it absorbs quickly but the finish is really dewy and slightly oily. I feel that my skin is constantly sweating although that's not the case. I expected a matte finish at this cost. But, it is good for sun protection and has PA++. Again, like I said, I wish this had PA+++ for added protection. 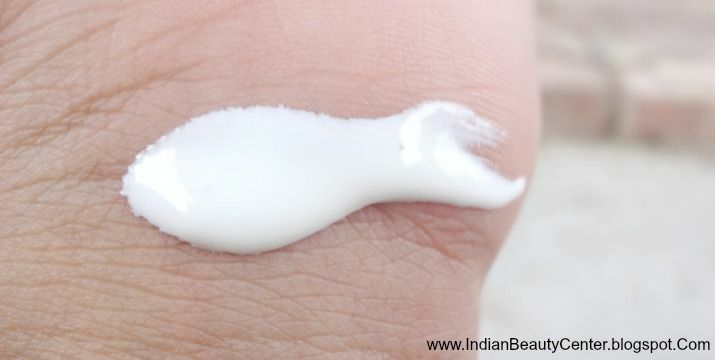 The sun is really harsh these days in India and hence, we need to keep our skin protected from all the damage. 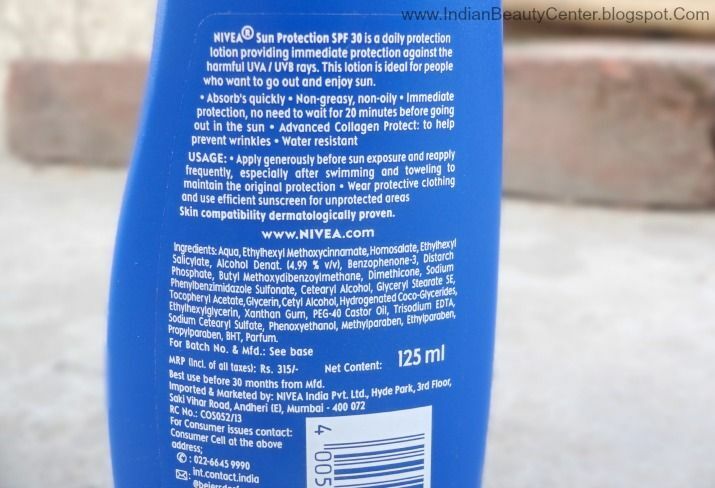 This Nivea Sun Protection lotion does its job nicely and prevents me from getting tanned easily. However, they need to improve this body lotion further and make is affordable too. 7) No need to wait for going out in the sun. I can just apply this and I am all set to leave! Final Verdict : This is not the best sun protection lotion in the market but not a total disappointment too. It would work well for those with dry skin as it moisturizes really well. If you are looking for ultra-protection or long wear time then this is not for you. Sounds like a pretty decent product! Very honest review Arpita!